This is a wonderful recipe for lamb chops. They are marinated in a luscious combination of soy sauce and brown sugar, roasted, then served with a delectable red currant jelly and coriander. It is an amazing combination of tastes! Put the chops in a plastic bag with the oil, soy sauce, brown sugar seasoning and lemon juice. Place the bag in a dish and leave them to marinate for several hours in the refrigerator. Turn the bag over a few times to ensure all of the meat makes contact with the marinade. Arrange the chops on a rack in a roasting pan and roast 15 - 20 minutes. While the chops are roasting, make the sauce. Heat the oil in a pan and cook the onion for 3 minutes. Add the remainder of the marinade from the chops and simmer for a few minutes. Add the sherry, water, red currant jelly, coriander, and seasoning. Simmer for 15 minutes. Thicken the sauce by cooking it down for a few minutes or by mixing 1 tablespoon cornstarch with 1 tablespoon water. Add a little warmed sauce and return to the saucepan. Stir and cook until the sauce is slightly thickened. Serve the chops with the sauce poured over. It is great over steamed rice. If you want a bit more color and like the idea of the addition of more fruit to the recipe, add a small drained can of pineapple pieces to the sauce. I personally like it without, but suit your own taste. The recipe is gluten free if you make sure the soy sauce you use is gluten free. Some are not. Lamb chops are traditionally served quite rare. Cook them a little longer if you prefer them more well cooked, but ideally they are best with at least a bit of pink in the center. Roasting them the length of time called for in this recipe should create a perfectly rare lamb chop recipe. 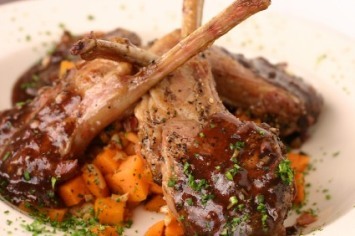 Have a look at one of our other lamb chops recipes here.